The holiday season is upon us, people are booking their holidays left, right and centre, whether that's a stay-cation or going abroad. This Easter Jet2 are here with a treat, not only to help you book your holiday but also to help you save money, in comes crackin' deals. 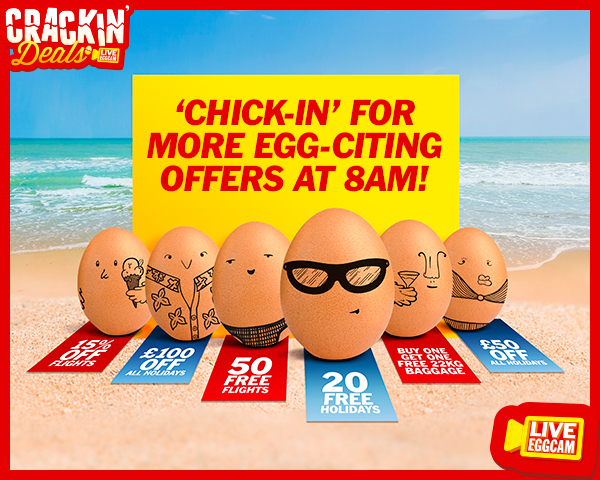 Crackin' deals see six chicks live on camera hatching, every time one hatches another deal is thrown in to the deals of all deals, including; 15% off return flights, £100 off all flights, 50 free flights, 20 free holidays, buy one get one free 22kg baggage and £50 off - the twist is, you have to be quick these amazing offers will only last a few hours. If you've already heard of crackin' deals you'll know chick number 6 has already hatched, yesterday, live on camera and 15% off returned flights has already been and gone. For more crackin' deals head on over to Jet2 website here (from 8am) and see the deals unravel this Easter weekend. For people on the go, you can also find these deals unraveling on Twitter, with hashtag #Jet2Chicks.